Summary: When Alma Sofia Esperanza Jose Pura Candela complains that her name is too long, her father tells five stories about the different family members for whom she is named. Each one connects to her in a special way. Her sixth name, Alma, is just for her. “You are the one and only Alma,” her father tells her. “You will make your own story.” The author’s note tells the story of her own full name, Juana Carlota Martinez Pizarro, and how it reminds her of her roots in Peru. Also available in a Spanish edition, Alma y Como Obtuvo su Nombre. 32 pages; ages 4-8. 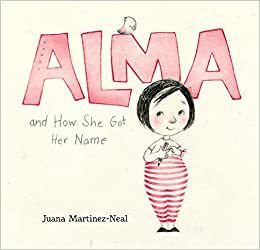 Pros: A lovely story by award-winning illustrator Juana Martinez-Neal that invites readers to learn and tell the stories of their own names. Cons: Alma may struggle with all those names when filling out online forms.